KKing David July 22, 2018 July 25, 2018 Poker scene, Whoa! I got this one right. In my last post, I coined the phrase “Bonomo bucks” after my successful investment in Justin Bonomo’s entry in the WSOP’s Big One for One Drop tournament. Two days ago, Bonomo tweeted a message for his YouStake backers, disclosing his chop arrangement with Holz, resulting in a final share for first place of $8,751,111. So I’ll get 8.75x return on my $200 instead of 10x. Since the combined prize money for 1st and 2nd place was $16,000,000, that implies Holz ended up with $7,248,889 for 2nd place. This led to some interesting Twitter chatter, including questions about YouStake’s obligations and disclosures when chops are involved. Interesting question would be: does Youstake have to pay out to your backers at the rate based on the top prize? If not, why not? "They" didn't agree to a deal at the FT. Or is that built into the wording of the agreement at Youstake? I look at it this way: I invested in Justin’s decisions. He made decisions every single hand played. Deciding to chop was simply one more decision. When I invested, that doesn’t create a right to cherry-pick his decisions. Therefore my return should reflect the decision to chop. YouStake’s Terms of Service describe the site as a “fully integrated sports staking platform (the ‘Platform’) that allows the masses to invest in skilled sports players for entry in regulated and reported events” (my emphasis added). “Regulated and reported” events, however, may or may not report the effect of negotiated chops just prior to the conclusion of a poker tournament. The more difficult question is what happens if a player gets extra money as a result of a negotiated chop. For example, suppose Fedor Holz had won the One Drop tournament and Bonomo finished 2nd. The stated payout was $6,000,000, but the chop increased the value of 2nd place to $7,248,889. What would prevent Bonomo from sending YouStake the proportionate share of $6,000,000 to distribute to his backers, and keep the difference? Bonomo is such an honorable person, this is virtually unthinkable. 100% agree with this. All of the best tournaments completely facilitate chops and make everything above board. Players should never have to do an under the table chop and hope they don't get stiffed. But what if it was a lesser known player involved in a lower profile tournament? Not every tournament facilitates or reports the outcome of chops. Later in YouStake’s terms: “The Service contains information, advice, text, materials, and services (collectively, the “Content”) that are provided for your convenience and entertainment. Third parties also provide some of the Content. You should be aware that the Content might contain errors, omissions, inaccuracies, outdated information, and inadequacies and that the Content may be subject to terms and conditions of third parties not directly under the control of YouStake. We make no representations or warranties as to the completeness, accuracy, adequacy, currency or reliability of any Content and will not be liable for any lack of the foregoing.” This appears to be YouStake’s way of taking itself off the hook, at least for now. YouStake’s official Twitter account “liked” a number of tweets on the subject, supporting improved reporting and transparency by poker tournament operators, but didn’t weigh into the discussion with any direct comments. YouStake should find a way to have winning players certify that the winnings transferred to YouStake includes any benefits resulting from prize pool chopping arrangements. Hopefully the major poker tours will improve their reporting on staking arrangements and chop deals. The best practice would be to accept the fact that many poker players have backers and frequently negotiate deals near the end of tournaments, whether the operators like it or not, whether they allow it or not, whether they report it or not. 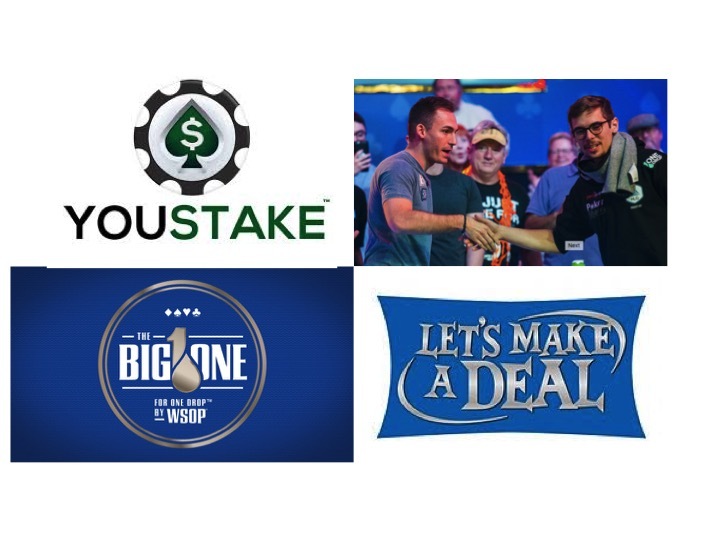 It’s clear that major poker tours will benefit from the success of sites like YouStake, which make it easier for more players to obtain backers, which in turn should increase entries in higher buy-in events. And more backers will watch more TV or livestream coverage. I understand the sexiness of final table announcers gushing over the large differences between 1st, 2nd and 3rd place money to dramatize the pressure the players might be feeling. This creates an incentive to deny any acknowledgement that players have hedged their risk by taking on backers or negotiating chops right there at the table. But staking and chopping are part of the game, so don’t pretend they aren’t. With free and open discussion of these realities, more poker enthusiasts will learn about sites like YouStake, and participation should grow. With more transparency in the reporting of results, all stakeholders will be protected. I’m not selling action, just promoting my poker blog… Please like / post / share /retweet on Facebook, Twitter or Instagram, or post a comment, and clicking the Follow button at the bottom of this page to be notified of all new posts. Well written and reasoned argument. Thanks for your time pondering this. I only asked the question as a what if? scenario and your response addresses everything I was wondering.